What is The Kabbalah Tree of Life Ascension series about? This experiential study allows students to receive the knowledge, understanding and wisdom from ancient teachings relevant to life today. The series provides lessons, study exercises and processes to awaken the senses and raise consciousness. It is an amazing journey to explore and experience the levels of consciousness to bring about new possibilities and opportunities for true living. Who should consider taking this series? Anyone interested in expanding their field of awareness in understanding to manage their thoughts, feelings, beliefs, actions. It is the one who wishes to grow, without boundaries, to examine how we work with spiritual energy to manifest what we experience in life. Why are sessions held over a period of time? Sessions are scheduled over a period of time to allow students the time to receive information and energy which is then practiced and experienced. This allows for deeper learning, to develop awareness and to bring into one’s self the understanding and wisdom provided to the student alone. Call or the center where you found this flyer. The series is $420, payable by cash or check. When you register, you will be asked to provide your name, birth name, birth day, and birth time. As much information that you can provide allows the teacher to provide additional information to help you through the program. Is there anything I need to bring for the class? We suggest that you bring a journal and pen specifically for this program. Many students have found it helpful to take notes on their insights and experiences of this program. It is a wonderful tool to be able to track and monitor your growth. You can come back to the study tools and practices again and again to help yourself grow in the process. Are other tools necessary for the class? The teacher will bring additional tools that will be used for the class. All materials are provided. If however, you have a tarot deck that you are fond of using, you may bring the deck with you for the class. Caroline Ravelo is a Spiritual Teacher, Life and Business Coach, Writer and Speaker. She is passionate about the teachings of Kabbalah and helping others enrich their lives through personal growth and life creation. Caroline works with clients and students from around the country who are dedicated to living a purposeful life based on the dreams and passions they choose to experience. 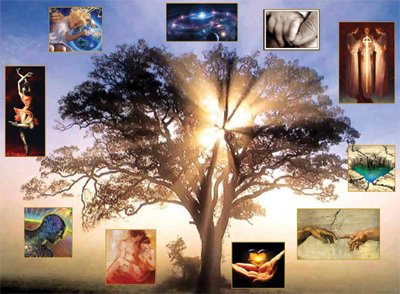 MONDAY, APRIL 19- Kabbalah The Tree of Life Ascension – 6:30pm. Come experience the wisdom and understanding of the Tree of Life. 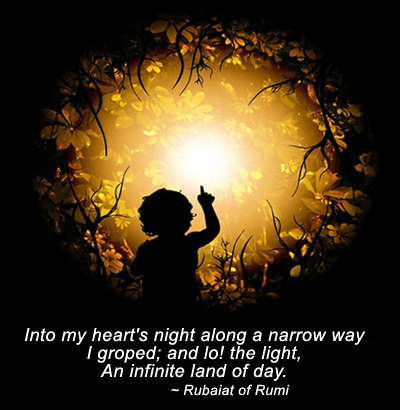 This journey awakens the senses and raises consciousness. 6 part series: 4/19,5/3,5/17,5/24,6/7,6/21, $420. Do you yearn to see an Environmentally Sustainable, Spiritually Fulfilling and Socially Just human presence on the planet? Through video clips of some of the world's most respected thinkers, inspiring films, and dynamic group interaction, the Symposium gives new insights to the opportunities we have to shape the direction of our world. Come together with conscious, aware people who care about what's happening in the world, our community, and our families and join the 40,000 people world-wide who have experienced the Symposium. Symposium cost: $20.00 per person – no one turned away for lack of funds. 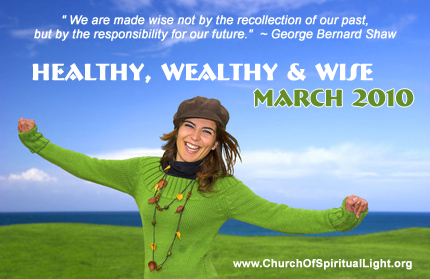 During the month of March at Church of Spiritual Light, we are focusing on being Healthy, Wealthy and Wise. For having one without the other is virtually useless to us and keeps us in a state of lack in some area of our life. It could be said that health and wealth stem from wisdom - not knowledge alone, but a culmination of knowledge and understanding which leads us to the source of our true wealth: our wisdom. Join us this month as we allow our higher selves, our higher power to provide the alchemical catalyst which will provide us with everything we need to become truly healthy, wealthy and wise! 1) I have access to the wisdom of the ages. 2) I am open to learning, un-learning and re-learning. 3) I experience new things with curiosity and wonder. 4) I appreciate and enjoy healthy foods. 5) I feed my soul, as well as my body. 6) I take only good things to my heart and soul. 7) I forgive my negative thoughts and feelings and tend to myself with loving care. 8) I believe in the eternal will to good. 9) I am a dynamic, multi-dimensional being. 10) I tap into the knowledge of my ancestors. 11) I move my body with ease and grace. 12) I run with the wolves and allow my soul the freedom of expression. 13) I trust my body. 14) Being human is divine. 15) I receive all things needful, both spiritual and material. 16) Money flows to me easily. 17) I respect and appreciate the abundance and the energy of money. 18) I allow the life force to activate within me. 19) I enjoy good health by taking care of my body and mind. 20) I schedule fun into my life every day. 21) I am a vibrant, joyful being. 22) I move into the future with confidence and joy. 23) I am open to experiencing more bliss in my life. 24) My mind and my beliefs attract everything to me. 25) My outer world is a reflection of my inner world and vice versa. 26) I take responsibility for my future. 27) I create a life of absolute abundance in all things. 29) I am seen and heard for who I am and allow others to get to know the real me. 30) I seek to know myself. 31) I allow the flow of the eternal will to good to enter my heart.